AirAsia and AirAsia X would like to encourage all guests travelling during the school holiday period to follow the travel advisory for a hassle-free holiday experience. It is advisable for guests to arrive at the airport at least 3 hours prior to scheduled time of departure for AirAsia flights and at least 4 hours earlier for AirAsia X flights to clear all travel formalities and avoid the expected congestion due to the surge of passenger numbers travelling during this period. 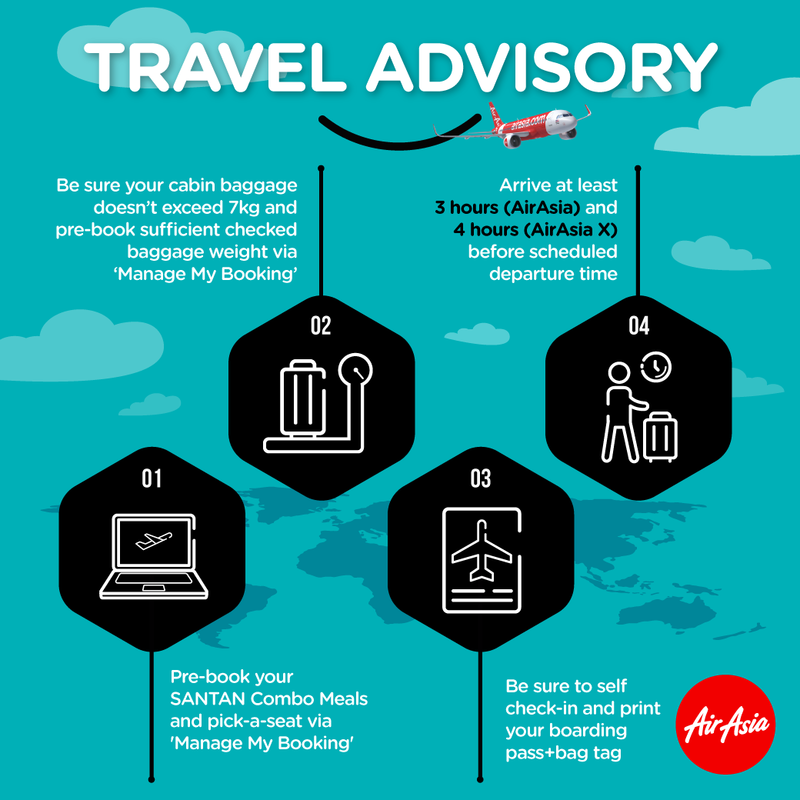 AirAsia would also like to remind guests to conduct self-check-in via web, mobile or kiosk services for a smoother journey. Web, mobile and kiosk check-in services are available 14 days and up to 1 hour prior to departure for all AirAsia flights and up to 4 hours prior to departure for all AirAsia X flights. The self-service options including Self Check-In and Self Bag Tag are fully operational at klia2, Langkawi International Airport, Penang International Airport, Senai International Airport, Kuching International Airport, Kota Kinabalu International Airport, Sultan Abdul Halim Airport, Bintulu Airport, Sultan Ismail Petra Airport, Sultan Mahmud Airport, Labuan Airport, Miri Airport, Sandakan Airport, Sibu Airport and Tawau Airport. For guests with baggage to check-in, Baggage Drop counters close 60 minutes before flight departure for all AirAsia and AirAsia X flights. As congestion is expected at the security scanning, baggage clearance and immigration checkpoints during this holiday season, it is best to complete baggage drop and proceed to the boarding gate as early as possible. For those who are traveling to and from Singapore, AirAsia is now operating at the new state-of the-art and fully automated Terminal 4 in Singapore Changi Airport, which can be reached by taxi, private hire cars, bus and personal transportation. Guests departing from Terminal 4 are also advised to arrive 3 hours before departure to ensure sufficient time to move through the new terminal. Guests with group booking, reduced mobility or with special needs are only allowed to check-in at the counter and should allocate more time to clear all travelling formalities. Rest assured, AirAsia’s ground staff will be available at the airport to assist all guests with their travelling needs to ensure a pleasant traveling experience during this holiday period. Each guest (except infants) is only allowed ONE piece of cabin baggage (not larger than 56 x 36 x 23cm in dimension) AND one laptop bag or handbag or small bag on-board and the total permitted weight for 2 pieces of unchecked baggage must not weigh more than 7kg in total. All guests are encouraged to pre-book sufficient baggage weight for more savings. Log on to ‘Manage My Booking’ to add more baggage weight allocation at airasia.com up to 4 hours before the scheduled time of departure or via the AirAsia mobile app on iPhone and Android devices. Combo Meals are available for pre-book up to 24 hours before scheduled departure via 'Manage My Booking'. Also, enhance your travel experience with FREE inflight entertainment including popular movies and short films, chart-topping hits and travel guides when you connect to ROKKI Wi-Fi on your mobile device. For those who can't live without the Internet, they can stay connected to their favourite chat and Internet apps with a ROKKI plan from as low as RM9. Not only that, AirAsia also provides an online shopping experience whereby guests can also enjoy exclusive in-flight deals from ROKKI Shop. Furthermore, year-end duty free and merchandise shopping is also made a whole lot easier with Prebook + Collect service by Big Duty Free. Guests can enjoy greater savings and convenience when they pre-book on bigdutyfree.com up to 48 hours for AirAsia (AK) flights and 72 hours for AirAsia X (D7) flights, and have the items delivered straight to their seat for free, either on their departure or arrival flight. AirAsia wishes all of our guests happy holidays. Keep updated with AirAsia’s latest promotions and activities via Twitter (twitter.com/AirAsia) and Facebook (facebook.com/AirAsia). AirAsia, the leading and largest low-cost carrier in Asia by passengers carried, services an extensive network of 130 destinations. Since starting operations in 2001, AirAsia has carried more than 400 million guests and grown its fleet from just two aircraft to over 200. The airline is proud to be a truly Asean (Association of Southeast Asian Nations) airline with established operations based in Malaysia, Indonesia, Thailand and the Philippines as well as India and Japan, servicing a network stretching across Asia, Australia and New Zealand, the Middle East and the US. AirAsia has been named the World’s Best Low-Cost Airline at the annual Skytrax World Airline Awards nine times in a row from 2009 to 2017. AirAsia was also awarded World's Leading Low-Cost Airline for the fifth consecutive year at the 2017 World Travel Awards, where it became the inaugural recipient of the World's Leading Low- Cost Airline Cabin Crew award. Oh good to know this information and advice about Air Asia Flight. This is very helpful, thanks for sharing. Getting more in love with Air Asia as now they have other retails join in to gain more points! Yee haa!